In addition to the preventable magnetic attraction hazard, JCAHO warns that some “programmable infusion pumps may perform erratically” when in the presence of a magnetic field. An evaluation of conventional infusion pumps within the MRI room found that the function was temporarily altered with three out of six infusion pumps during exposure to 3-Tesla MRI conditions. IRadimed has been dedicated to advancing MRI safety with its Non-Magnetic infusion pumps for nearly a decade. The MRidium system is the first and only infusion pump cleared to administer patient IV medications at the MRI bore*, directly contributing to JCAHO compliancy and safety when compared to using conventional magnetic infusion pumps. IRadimed is the world’s only provider of Non-Magnetic IV infusion pumps. Infusing at the bore can improve the MRI care cycle while reducing operating costs. The MRidium Non-Magnetic IV infusion pump allows clinicians to infuse patient medications and fluids at the MRI bore, extending the same patient bedside practices to the MRI that are common throughout the rest of the hospital. DO YOU USE TRADITIONAL IV PUMPS WITH EXTENSION LINES FOR MRI CASES? Adding long extensions to conduct an MRI scan can be harmful for patients. HAIs (Hospital-Acquired Infections) are among the major causes of death and increased morbidity among hospitalized patients. HAIs add to the functional disability and emotional stress of the patient and in some cases, lead to disabling conditions that reduce the quality of life. Approximately 87% of bloodstream infections (BSI) are associated with the presence of some type of intravascular device. Airborne contaminates often settle on floors where IV tubing may be inadvertently contaminated when allowed to contact the floor or through subsequent manipulation of multiple connections and access ports. “Keep all IV tubing off the floor” is one of the prevention measures that should be taken in the MRI. IRadimed’s MRidium infusion pumps operate at the bore* thereby reducing the chance IV tubing can contact the floor surfaces. Additionally, Non-Magnetic infusion pumps can minimize the number of IV connecting ports needed which can also decrease the potential for HAIs. The length of IV tubing directly impacts the resistance needed to push the medication through the tubing. Physics proves that tubing having twice the length will have twice the resistance, which reduces flow. [8,9] Each extension set addition, increases the fluid pathway requiring greater force and higher pressure (PSI) settings on the infusion pump. “It is dangerous if the pressure alarm limit is set too high” as increasing the pressure limit (PSI) directly delays the time to activate the occlusion alarm. “If a high alarm pressure has to be configured to sustain a high running pressure, there will be unavoidable consequences for patient safety, which should be understood.” Clinical practice should create an environment where infusion pump “settings should be at the lowest appropriate pressure.” IRadimed MRI infusion pumps allow you to infuse IV fluids at the bore* with the shortest possible IV line and lower pressure limit settings. 300% More Flow Resistance can be experienced with 30 feet of IV lines versus a standard IV set. Once an occlusion happens, a patient will then inevitably suffer a significant period of time without the intended therapy. Once the occlusion is released, an unintended bolus of medication occurs due to increased pressure generated in the IV tubing during the occlusion. [10,12,19] Post-occlusion boluses greater than 0.5 mL have been demonstrated in a case study using standard bore extension IV tubing at ambient temperature. ECRI recommends that post-occlusion boluses should have a volume of 0.5 mL or less. Depending on the situation, an unintended bolus greater than 0.5 mL could have a serious impact on a patient’s condition. 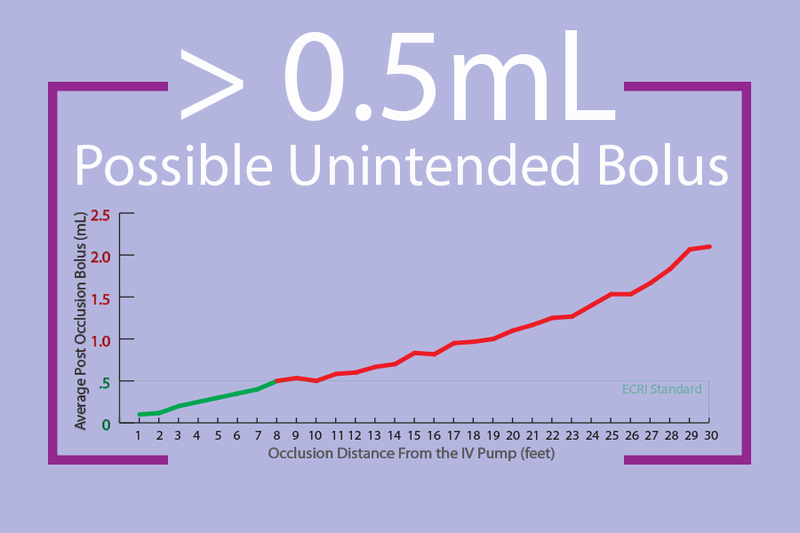 A case study demonstrated that occlusions in the IV tubing greater than 8 feet (2.4 meters) away from the pump can exceed the 0.5 mL ECRI guideline. IRadimed’s MRidium infusion pumps are designed to infuse at the bore* helping reduce the length of tubing needed for MRI infusions. Faster Treatment: Infusing at the bore* utilizes shorter IV lines and allows emergency treatment to begin immediately. Patient Safety: Critical infusions are maintained during the entire code event since IV tubing disconnection is not required to evacuate the patient. Staff Efficiency: Clinicians have more time to focus on the patient instead of untangling IV tubing and manipulating access ports. IRadimed Non-Magnetic MRI infusion pumps allow clinicians to infuse at the bore* using fewer line connections and tubing. Shortening the length of IV tubing used may contribute to improved financial scenarios with the reduction of waste and HAI’s. Shorter IV lines reduce the amount of tubing and drug discarded after the MRI procedure. For example, 32.5 feet (9.9 meters / 390 inches) of common IV extension tubing will contain approximately 63.2 mL of medication per IV line. A comparison example utilizing Propofol at a cost of $40 per 100 mL illustrates a $28 savings** per patient IV medication. Infusing at the bore* means shorter lines, less waste and potential cost savings. In addition to waste, HAIs can also negatively impact financial outcomes. According to CMS 2015 HAC List, vascular HAIs are not eligible to receive additional payments to cover the incremental healthcare costs. The CDC estimates that Blood Stream Infections (BSI) can cost between $5,734 and $22,939 for a single incidence. A hospital-acquired IV infection increases a patient’s hospital stay by approximately 20 days which greatly contributes to the incremental costs. Hospital-acquired infections add to the imbalance between resource allocation by diverting scarce resources to the management of potentially preventable conditions. DO YOU DELAY YOUR PATIENT'S MRI EXAM UNTIL THE IV THERAPY CAN BE DISCONTINUED? 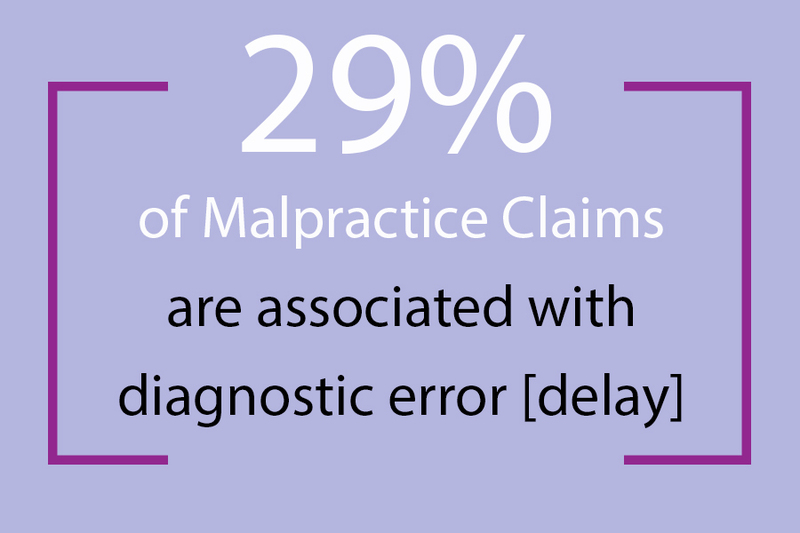 In reviewing 25 years of U.S. malpractice claim payouts, Johns Hopkins researchers found that diagnostic errors accounted for the most severe patient harm, and the highest total of penalty payouts. They define diagnostic error as a diagnosis that is missed, wrong or delayed. Transporting critical patients for an MRI has demonstrated to have a good risk / benefit ratio. The results from diagnostic examinations have directly resulted in a change in patient therapy and management in up to 70% of critically ill patients. Delaying a critically ill patient’s MRI diagnosis can be directly correlated to a delay in therapy which can result in a longer stay for the vast majority of cases. Waiting for a critically ill patient to be stable enough to discontinue all continuous IV infusions can delay their MRI diagnosis by several days. This MRI diagnosis delay can not only add significant cost but also delays a patient’s diagnosis, corresponding treatment, and release. The practice of delaying an MRI diagnosis because the necessary equipment has not been acquired may end up costing you and your patients more in the long run.